While the respective members of Green Lung probably don’t know a Green Shield stamp from a Ford Cortina or The Magic Roundabout, the spirit of the 1970s nevertheless indelibly runs through their sonic spirit like a stick of rock. Debut album Woodland Rites is a wonderfully warm collection of expressive songs embedded with the fuzzed riff remnants of Sabbath and Zeppelin. There’s a real openness about these tracks that really kick in with the schmoozing title track that follows the adroitly plucked opening instrumental ‘Initiation’. There’s an earthy holistic energy at work on this release that is reminiscent of Canadian occultists’ Blood Ceremony, albeit minus the flute. By way of reinforcing their spiritual values the album release date was timed to coincide with the Spring Equinox although whether the five members of Green Lung spent that dancing naked around Stonehenge is a matter purely of conjecture. 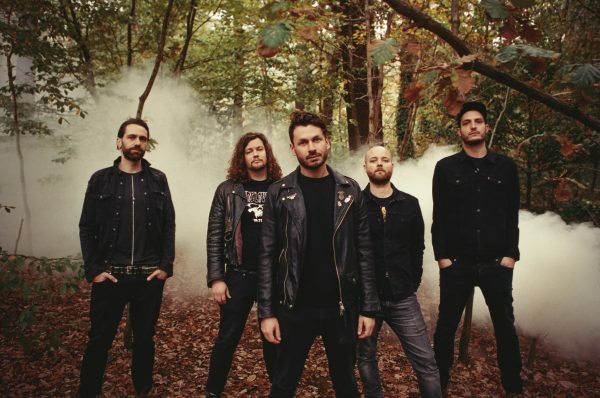 The south London outfit have already shared stages with celebrated doommakers such as Primitive Man and Conan although their own interpretation of slowly knitted rhythms is infused with more kaleidoscopic elements that help make Woodland Rites an infinitely more accessible proposition than some of those who lurk in the darker corners of the doom diametric. 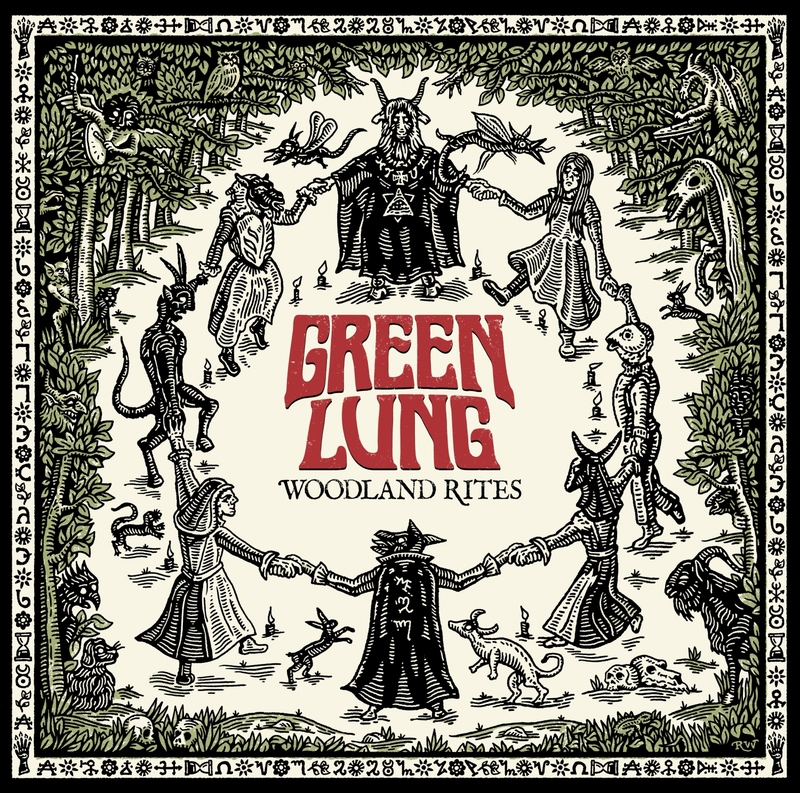 While not as overtly demonic as some bands of the genre, Green Lung are certainly not immune to making tunes capable of putting a smile on our cloven hoofed friend. Singer Tom Templar has an almost Ozzy like quality, shamelessly pleading on one song ‘open up your hearts and let the devil in’. Since the release of their impressive debut EP Free The Witch – on the back of which they were signed by Berlin retro record label Kozmik Artifactz – Green Lung have been joined by John Wright and his impact with the keyboards certainly lifts the sound and offers even greater scope for the quintet to indulge their blasphemous beats. The album’s longest track ‘The Ritual Tree’ is certainly possessed by a haunting dialogue inspired by the likes of The Whicker Man. This spooky walk through the dark woodlands invites comparisons with Alunah’s ‘Bricket Wood Coven’ bewitching. Guitarist Scott Walker embellishes the sound with some scorching solo walk before the track builds to a rousing finale. ‘Call of the Coven’ is one of the pacier numbers, one that will have all witches tapping their broomsticks in approval, with Templar waxing very much in the style of the inimitable Christus from Saint Vitus and Count Raven. The flowing grooves are soaked in sorcery and if this doesn’t tempt you to venture out barefoot into the woods nothing will. The tempo on the sweeping bluesy ballad ‘May Queen’ is much more restrained as Green Lung summon all the pagan pageantry they can muster for a majestic weepy of a song that allows them to reveal their more introspective side. 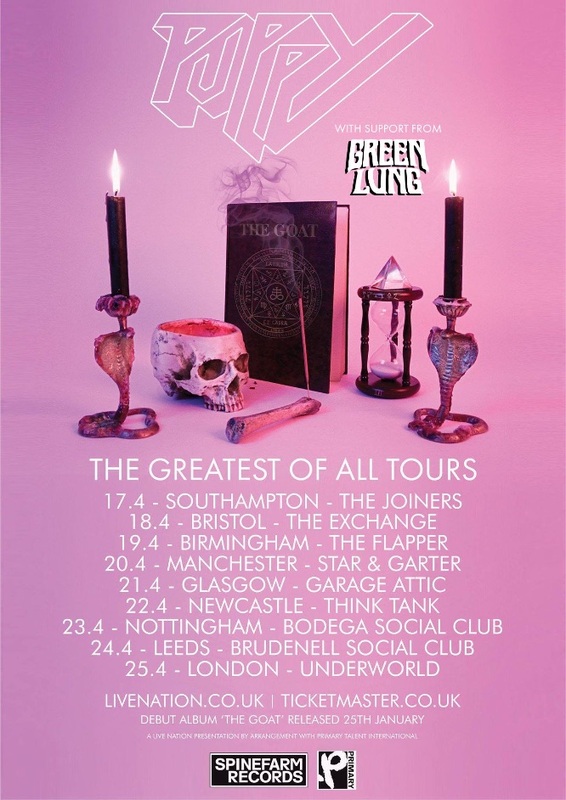 Green Lung are on tour with Puppy in April with two stop offs in the Midlands so get along to either Birmingham or Nottingham if you can (full details below).